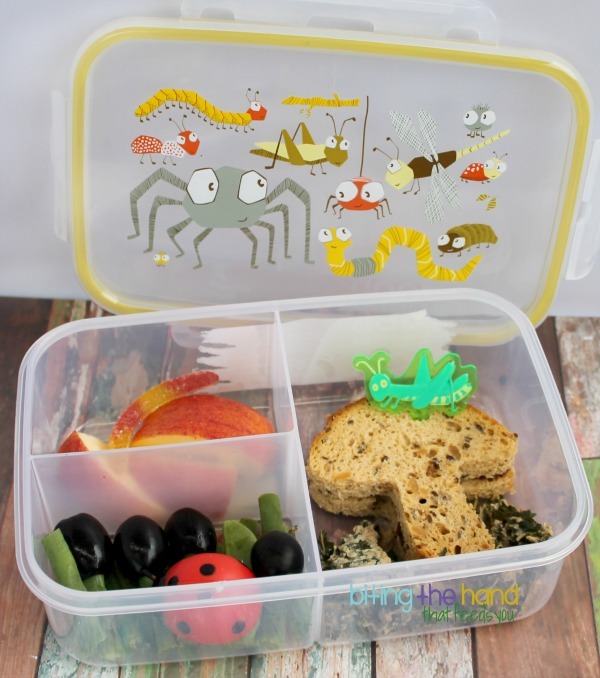 I've been looking for the perfect excuse to use our SugarBooger "Icky Bugs" bento box (available on Amazon and at AllThingsForSale) and whipped up a quick and easy bug-themed lunch thanks to some "pick-ography!" For both sandwiches I wanted a chocolate filling, since it feels more earthy. I chose Peanut Butter and Co Dark Chocolate Dreams; we don't do Nutella here. Nutella has artificial vanillin flavoring, a wood-pulp manufacturing byproduct. Yum. Plus Z has neurological reactions to it. No thanks. The gummy worm is from Surf Sweets - no fake colors or flavors, no animal gelatin, made with organic sweeteners, and made in a facility free from the Top 8 Allergens (and gluten,) so safe for most classroom allergies! I gave her a butterfly cupcake ring to change things up. 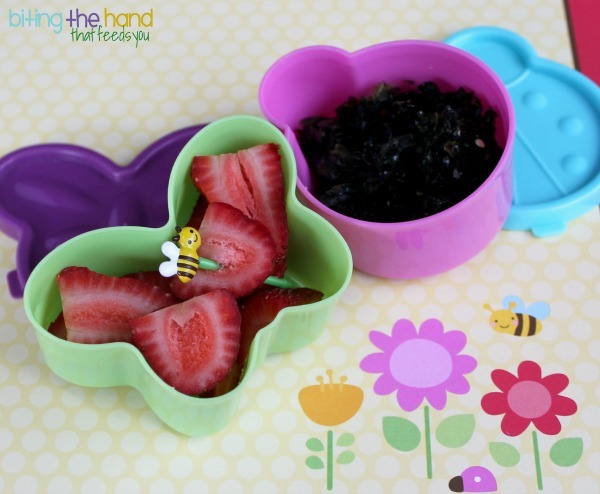 Plus they're fun for little fingers to play with! 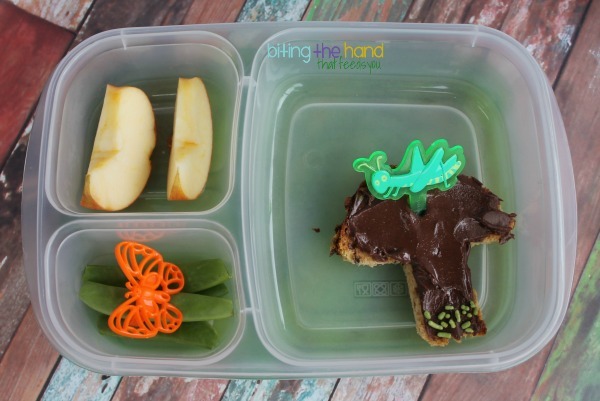 E didn't get a gummy worm in her lunch because she ate hers while I was packing the lunches. Punk. 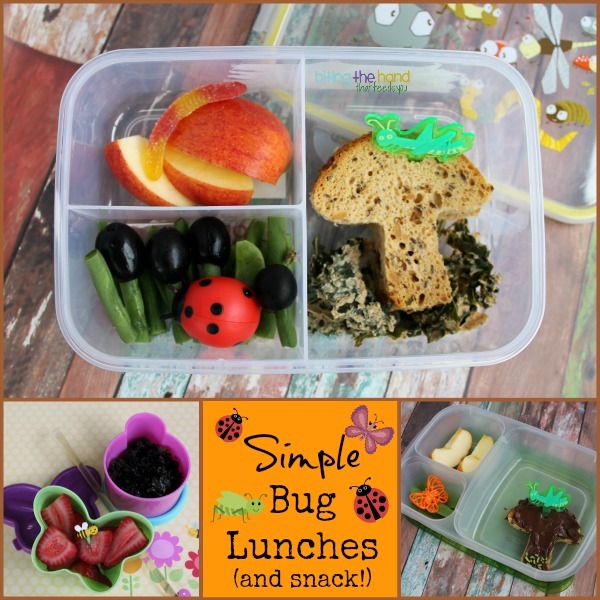 10/1/13 - Since I had these adorable bug-shaped snack pots sent from the UK by my friend from Eats Amazing, a bug-themed snack was in order! Just a simple one, with a cute little bee pick added in.